That simple saying evokes one of two reactions in most of the American public: a violent, disgusted shudder or amused glee. 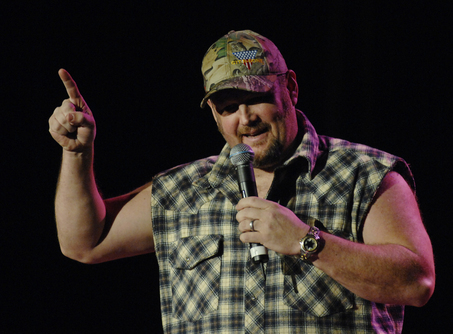 I’m in the gleeful category, which is why I was amused to hear everyman comedian Larry the Cable Guy has taken his new TV show, “Only in America with Larry the Cable Guy,” on the road to feature Marines at Camp Pendleton, Calif. The History Channel will air the show Tuesday, April 12, at 9 p.m., according to the Facebook page for the Marine Corps Motion Picture and Television Liaison Office. Larry the Cable Guy believes the United States of America is the greatest country on the face of the earth and he’s out to prove it. In Only in America with Larry the Cable Guy, Larry crisscrosses the nation, going totally off the beaten path to find the people, places and things that define this nation’s unique history. Each episode uncovers surprising information about America’s history from the story of how moonshine-making during Prohibition gave rise to one of America’s most celebrated past times–NASCAR racing–to the history of etiquette from Emily Post’s heirs in Vermont, complete with a lesson in good manners. From panning for gold in the hills of California to leading a cavalry charge in a Civil War reenactment in Virginia, Larry gives history a fun, down-home twist. Sounds about right. Ahem… Git-R-Done! UPDATE: This photo just appeared on the Midwest Marines Facebook page. Yep. Larry the Cable Guy in MARPAT. True story: A friend of mine got married last summer and wore a sleeveless tux shirt to the reception with a camo hat. You really make it appear really easy along with your presentation however I find this topic to be really one thing which I think I’d never understand. It kind of feels too complex and very broad for me. I am looking ahead on your subsequent put up, I will attempt to get the hang of it! Interesting article! Please publish more! blufftonhost.com Great Webhosting.